Magic Fans! Keep your chin up! Yes, we are going through some very difficult times with the lockout, but that’s not stopping the Orlando Magic front office from their full involvement in our community. On September 29th we a had two full fields of play for the Annual OMYF charity golf tournament at Disney’s Palm an Magnolia Golf Courses. The conditions were pristine and the stands were nearly set for the Children’s Miracle Network Hospitals Classic Tournament. I had the opportunity to play with my good friend Chris Kirkpatrick from N’sync. Golf is definitely a passion of ours, even better when it can be involved to help the community. In November, I’ll be hosting and DJ’ing another one of my friend’s music and golf events who is constantly ‘giving back’. Johnny Damon’s “Johnny Jam ‘11” benefiting Wounded Warrior’s Project, PACE center for girls, and Make a Wish Foundation just to name a few. 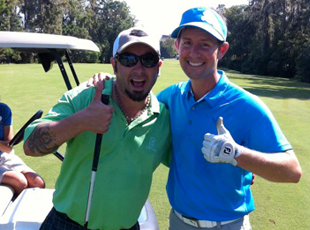 Then it’s back with Chris in December for the Chris Kirkpatrick Foundation Golf Tournament. Good times, great golf, but even better people.